Simply put, zero based budgeting accounts for every single single dollar you earn. Your goal is to end up with a home budget that has a bottom line of zero. But wait, you say--doesn't making a budget involve aiming for a surplus? Shouldn't I have money left over after subtracting expenses? You do want money left over after you've accounted for what you spend. But what do you do with that surplus? Do you work on paying down your debt? Do you bump up your retirement account contributions? Do you add to your rainy-day six-months' expenses savings account? Do you save for college for the kids? Do you set the surplus aside to help buy a new or used car in cash at some point down the road? Do you lay away for a large future expenditure, like buying a home, purchasing new appliances, or having home maintenance done? Or do you need to do all of the above? 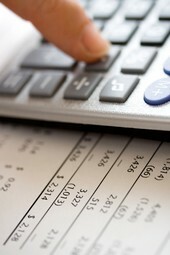 Household budgeting involves more than just figuring out whether your income exceeds expenses. You should be using zero based budgeting to develop a plan for how you spend the money that comes your way. The only goal is to have money left over each month. This leads to a mentality where you feel as though you can spend every dollar you earn, as long as expenses don't exceed income. You end up becoming focused on a budget surplus, leaving you to randomly decide how you'll "spend" your surplus each month. Temptation grows as you consider that big pile of cash left over at the end of the month. You're not forced to come up with debt reduction strategies or savings plans. We all know it's human nature to spend money that's just "sitting there". Once the money's gone, we tend to feel guilty, and simply give up trying to stick to the home budget we've set up. The goal is to create a surplus of funds each month and then plan how those surplus funds will be spent, until each and every dollar is either spent or saved. Budgeting money, like dieting, is more a head game than anything else. You need to design a home budget that "tricks" your brain into thinking the entire process is something good, something fun, and something worthwhile. Traditional personal budgeting focuses on reducing expenses so you can break even, or--just maybe--have some money left over for "fun". So what's the message sent to your brain? "I have to cut expenses until it hurts, and even then, there may not be "fun" money left over." It's all about deprivation. That's not going to motivate your brain to "feel good". This is where the benefits of zero based budgeting really kick in. Zero based budgeting doesn't focus on what's left over after cutting a bunch of expenses. Instead, zero based budgeting focuses on taking the total amount of money available to you each paycheck and deciding how you want to spend the entire pile. As far as your brain is concerned, it's much more fun to spend money--especially a big chunk--than it is to plan how it shouldn't be spent. Plus, the zero based method of making a budget has the added benefit of forcing you to come up with debt reduction, savings or investing plans and goals, because you need them in order to determine how all your dollars will be spent. In fact, when you're budgeting this way, you're probably better off allocating your debt reduction, saving and investing dollars first. Automate the process of allocating those dollars (via direct deposit, automatic withdrawals, and so on), and you're automatically building wealth before you even start thinking about allocating expenses. Success motivates you. Failure doesn't. Break the cycle and adopt a household budgeting method that works with your natural tendencies instead of having to constantly fight your natural impulses. Take control of your money and try zero based budgeting today!